This has to be one of my most favorite looks for winter! I am all about looking chic and casual while being 100% comfortable. My favorite part about the outfit? The tie sleeves on the sweatshirt! 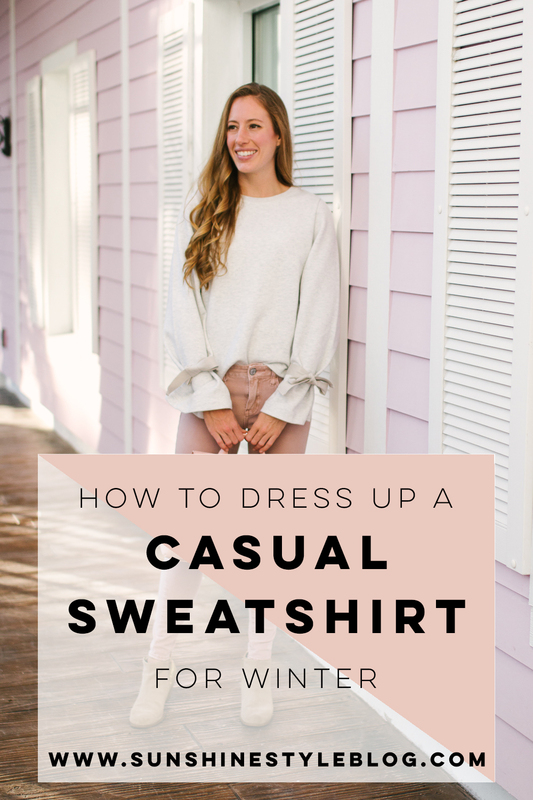 They give it such a feminine touch while still staying true to a casual sweatshirt style. Let’s talk a little about the beautiful camera bag I’m wearing above. One it’s completely awesome! Two, it can convert to a backpack, crossbody and regular purse (the way I’m wearing it in the photos)! It’s amazing and comes in blush pink, black, tan and gold! What more could you ask of a camera bag? Although it’s a bit of an investment, the price is worth it since it’s so functional and I need it to last a long time. Fun story behind this bag. My old lens broke because I set it on a bar stool and it fell off. Woopsies. This time when I ordered a new lens, I knew I needed to find the perfect camera bag to house my new lens. I stumbled upon this bag when watching my Instragm stories and saw A Beautiful Mess posted about their camera bag collaboration with Kelly Moore. They were offering the bag at a major Black Friday discount which is when I snatched it up. You can still buy it for under $170! Are these not the most amazing glitter boots ever? I always get so many compliments on them and people asking where I bought them from. 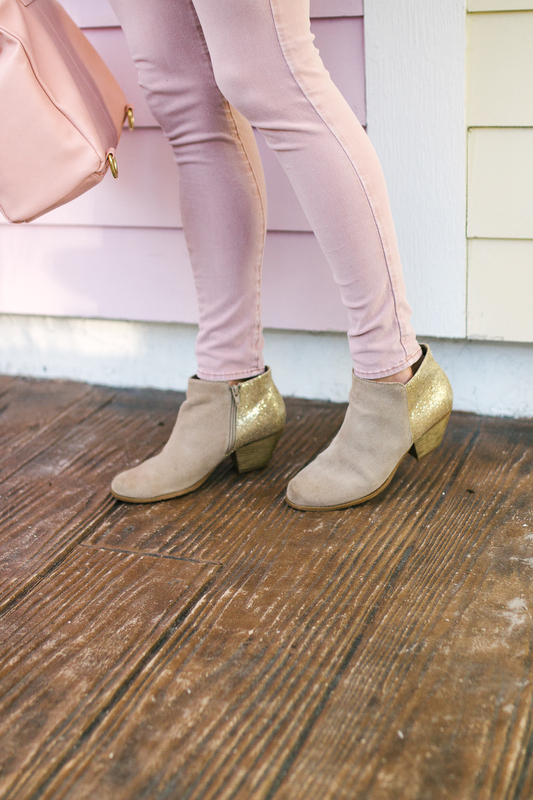 Here’s a super similar pair under $150 (my fav) and if your on a budget, I found another glittery option under $60! Within the next few weeks I was thinking about putting together a post about different types of boot styles in several price ranges and where you can buy them from. Is that a post your interested in? Let me know in the comments! Since it’s seldom cold here in Florida, I have to get pretty creative when it comes to dressing for winter. Layering is almost non-optional.That’s where casual sweatshirts turned fancy come into play. I ordered this grey one from J.Crew a while ago and fell in love with the tie sleeve detail. It’s since sold out but I found similar options all under $40 here, here and here. I like to stick with neutral tops like this grey sweatshirt for winter to mix and match to create more options. 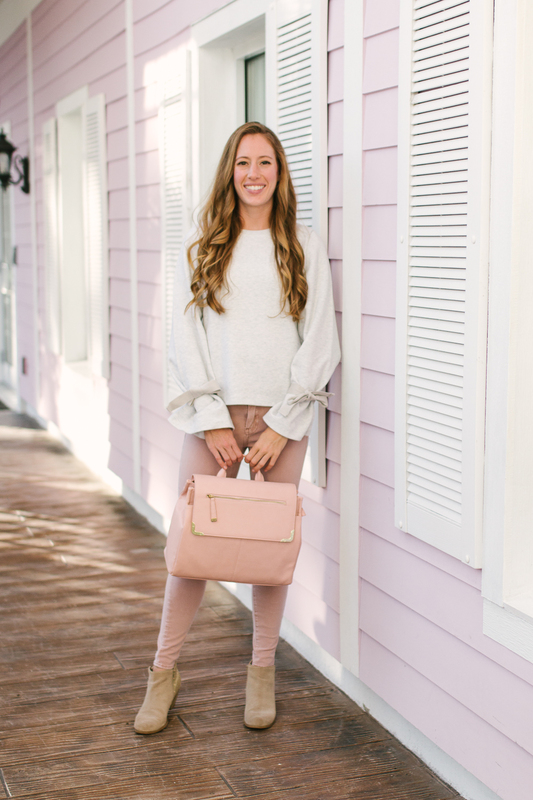 For this look, I paired the casual grey sweatshirt with blush pink pants. I’d consider them pajama level their that comfortable. 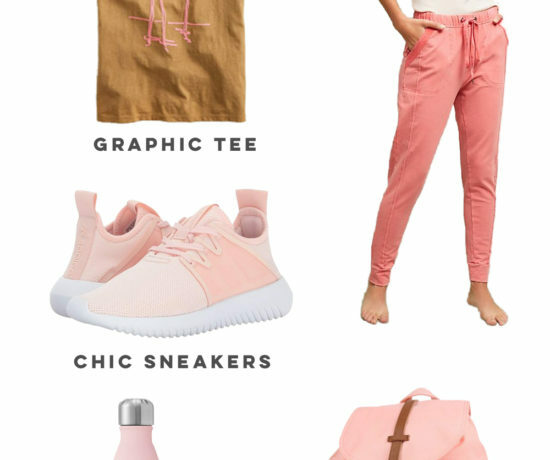 Not a pink gal? Try navy blue, white, burnt orange, or mustard yellow! A colorful skirt in a fall/winter color like marigold or burgundy would would also work perfectly with a neutral sweatshirt! 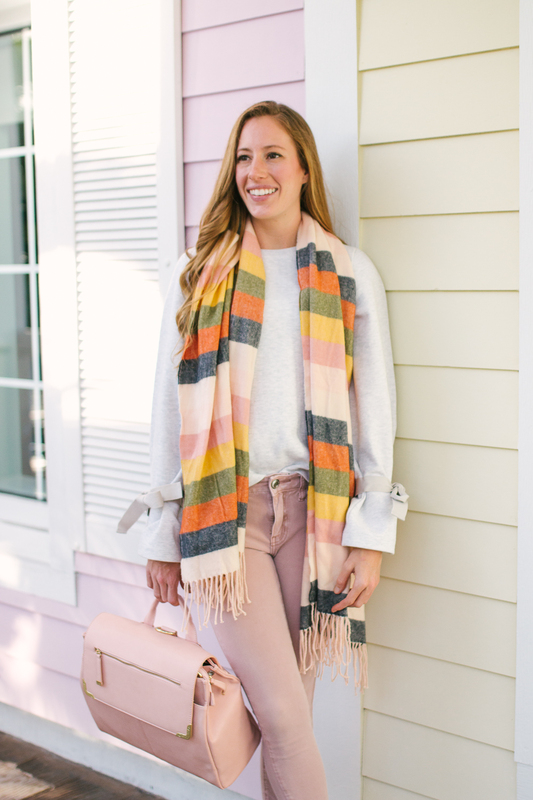 To tie the blush together, I added my camera bag turned purse and a Target scarf with a blush accent color. What’s great about this outfit is that anyone can pull it off. If you live someplace warm like me, layer a scarf over the top instead of a jacket. Target has so many great options. The striped one I’m wearing is A New Day x Target and is under $20. Use your Target Card and you can get an extra 5% off! Hope everyone is off to a great week! Work has been sort of crazy the past few days due to exam prep. Honestly, as a teacher I am coming to terms with the fact that you just never feel caught up. For those who don’t know I am a middle school fashion/culinary teacher. Fashion blogger during my free time, teacher to crazy kiddoes during all my other time. The past weekend I was at an AVID conference in Orlando for work which was super fun but now I feel so behind schedule. Hopefully this week I can get semi caught up with grading projects and inputting grades so I can relax a bit during winter break. I am so excited for 2 weeks off for Christmas!!! All the pre-work will be worth the vacation time. Fingers crossed. 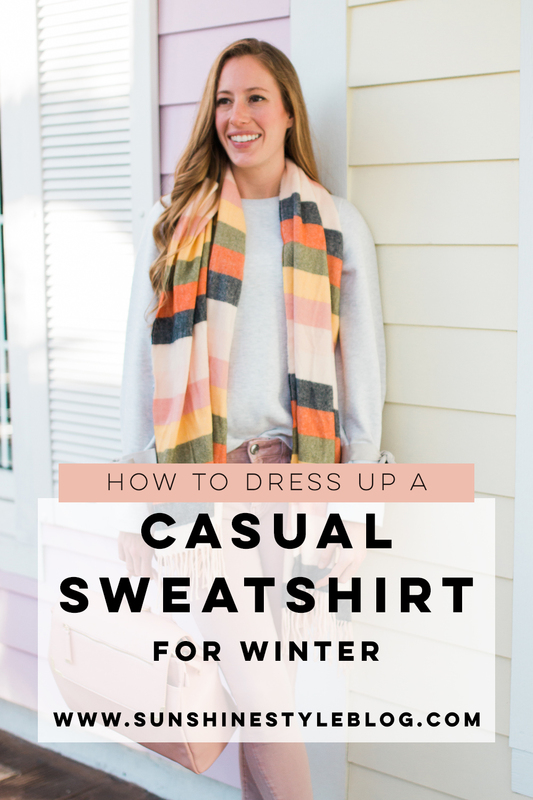 Do you love wearing comfortable sweatshirts in the winter? Tell me in the comments below! Burgundy LOFT Shorts Are The Bomb! 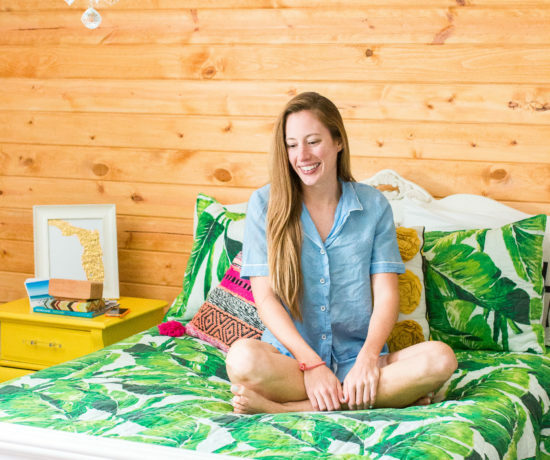 In a sea of plaid outfits in blogland, it is so refreshing to see this color palette! I ADORE that scarf, and I’m so happy it’s from Target! May just have to go scoop that up. 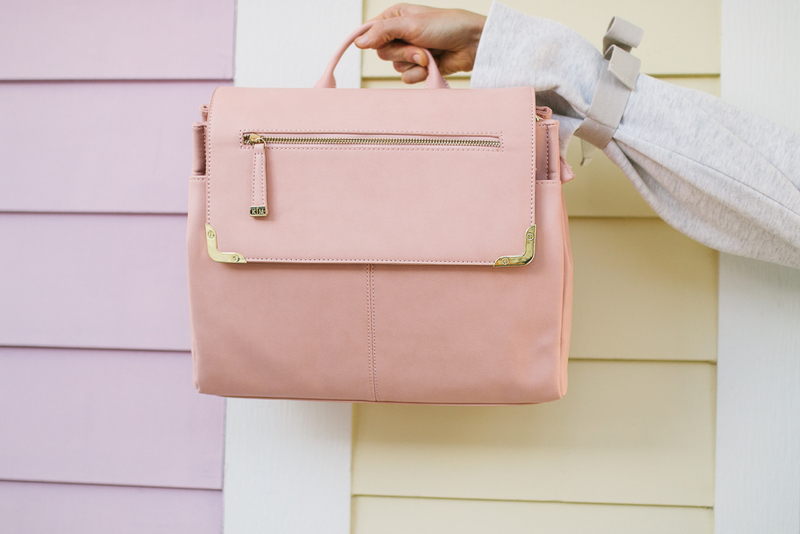 My friend just showed me her new purse, and it’s the same style-where you can make it a backpack or a regular purse strap. It’s amazing! A brilliant idea actually. Yessss to color! Thanks for the encouragement girl! Go grab it, it’s on sale for $11! Yes, it is a brilliant idea. All women should be given that option with their bags. Where did she get it from? P.S. I bought that detangler spray you linked from Amazon today. I hope it works well with my hair! That outfit is too cute! I love the pink paired with the white. Thank you Courtney! Hope you have a Merry Christmas! Omg I love those boots! I mean the whole outfit is adorable but I LOVE this boots! Thanks Christina!!! =) =) The boots are a fav for sure! Love the scarf! What a great find! Thanks so much Rebecca!!! For real, this will most likely be my best winter find this year! By the way, love your blog name! Hi Katie, I am Ada. So glad I found your stylish blog. Love the name of it. 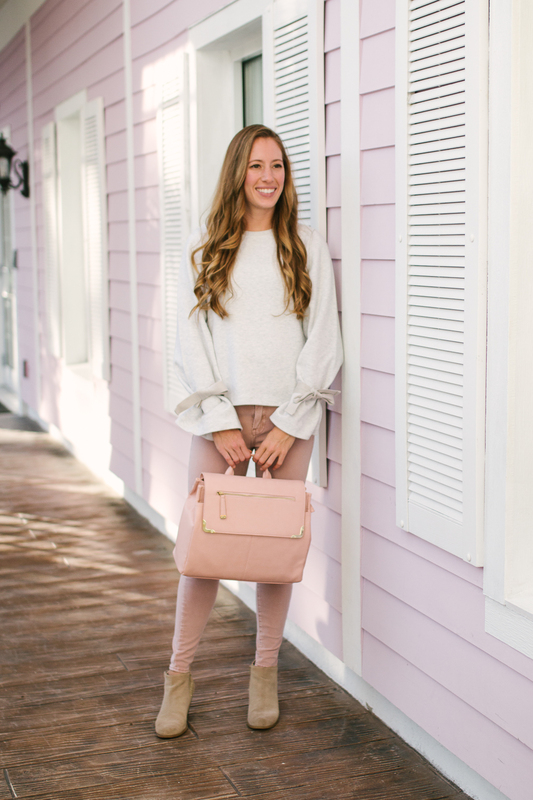 I am a huge fan of soft neutrals paired together, especially with a splash of color thrown in. That rainbow striped scarf is gorgeous and what a pretty sweater! I welcome you to stop by my blog as well. Welcome by today and every Thursday to share your gorgeous style by linking up with me. Thank you and Happy New Year! Hi Ada! SO glad you found my blog and I hope it brings some sunshine to your day! 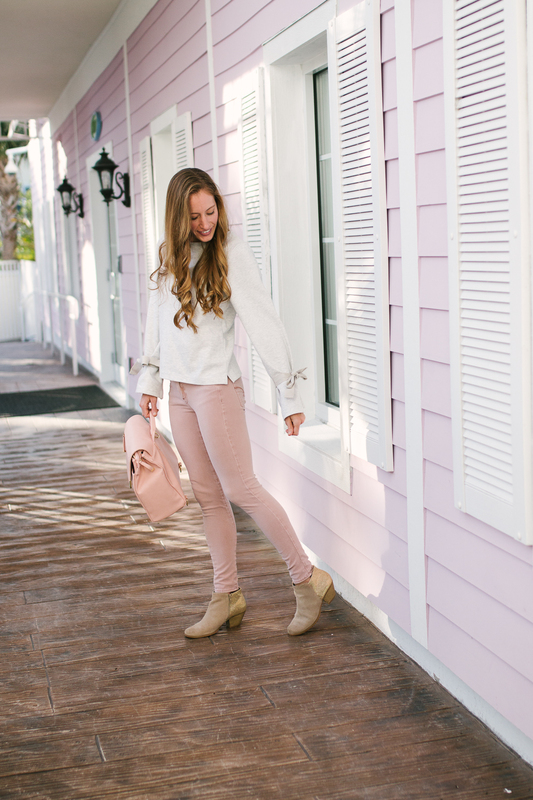 Yes to color and mixing neutrals! I’m almost 100% sure the scarf is on sale now at Target! Cool, I will be sure to stop by! That is the cutest sweatshirt! I love the ties and how stylish it is and comfy it looks too! You are adorable! Thanks Ruth!!! It is SUPER comfortable!